Imagine a video conference call way past my bedtime of 8 pm. On this call are 5 other bloggers that started out as strangers at Haven and have since become friends. Imagine your hair is slightly damp, you’re in your pj’s, you’ve already taken out your contacts, and you’re sipping on a cup of cocoa even though it’s 80 degrees outside and barely fall. 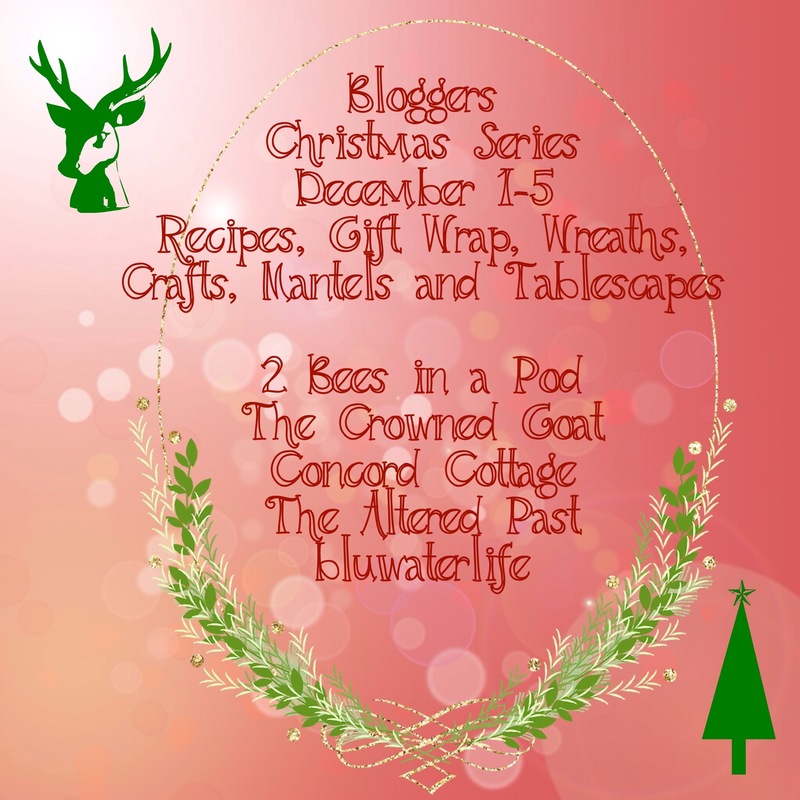 Now imagine you’re having a good time laughing and talking it up until someone mentions how great it would be to “create a wreath as part of the holiday blog series.” No playing, I almost choked. Say what? 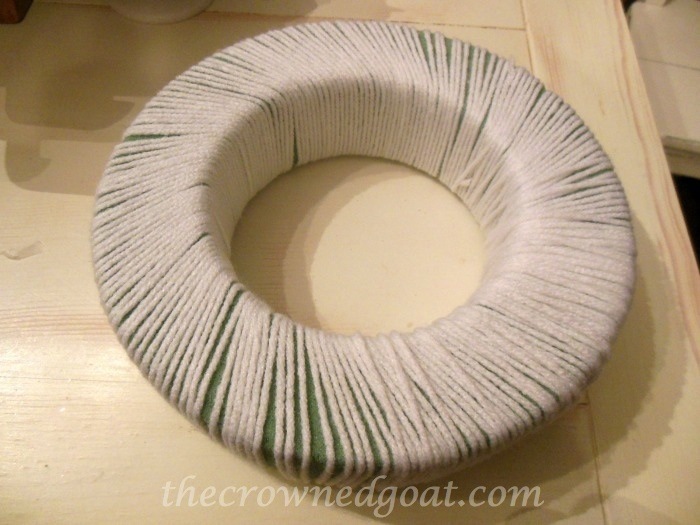 Create a wreath? I panicked. Umm, sign me up for the recipe, the tablescape, the wrapping paper, ok, I can even manage a “holiday craft” but a wreath seemed daunting. If you knew my schedule in the days leading up to this series, you would have told me to pack it in. 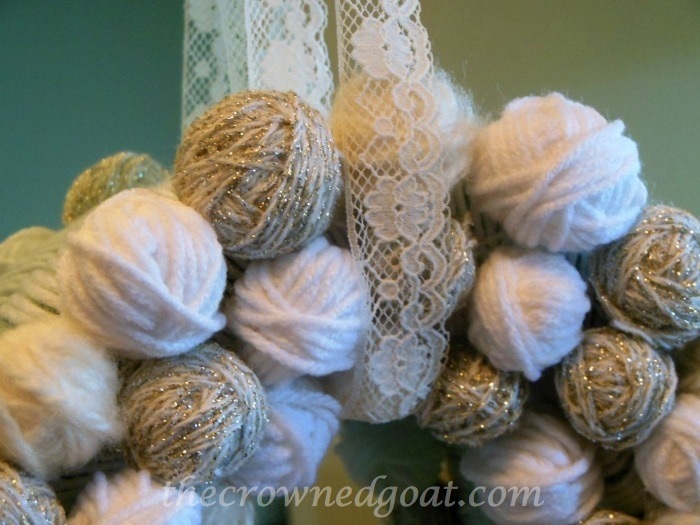 Thanks for appreciating all of that loveliness in advance as I unveil my holiday yarn ball wreath. Not wanting to let my blog buddies down, I went to the dollar store and accepted the challenge. I bought this floral foam for a dollar. 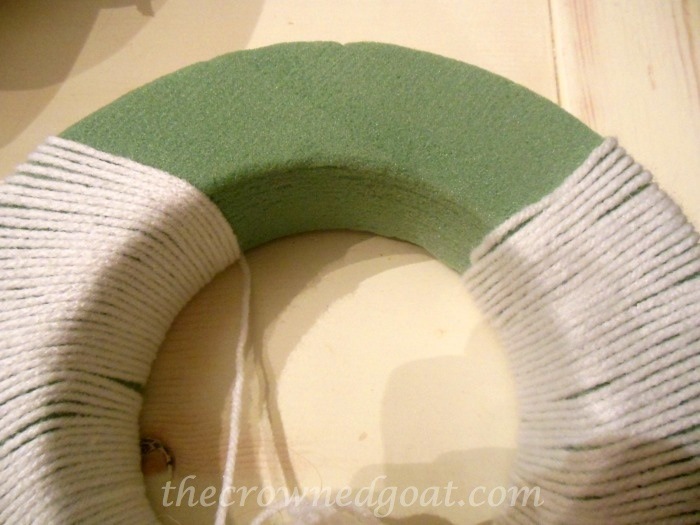 Once, I got home I wrapped the foam in white yarn. 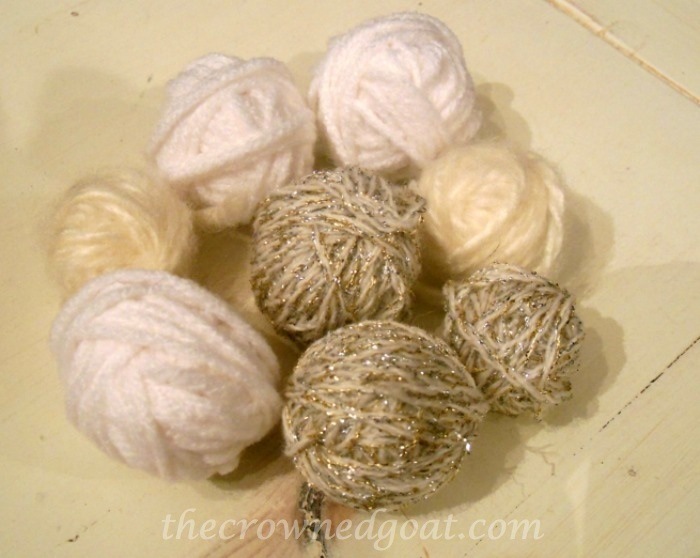 Next, I set about making yarn balls from different textured yarn. I made enough yarn balls for three rows and glued each yarn ball onto the floral foam with fabric glue. When I told one of my blog buddies, I was probably going to have the smallest wreath in the series she was laughing so loud I had to put her on speaker phone. But I’m completely secure in my craft skills. This tiny wreath has a really big heart. Check out the wreaths these ladies made Vicki and Jennifer at 2 Bees in a Pod, Bobbi at Bluwaterlife, Lisa at Concord Cottage and Angie at The Altered Past! See you guys back here tomorrow for Day 4 of this holiday series – crafts! Ha ha you’re so sweet Liz, thank you! I was like the little engine that could trying to make all of those yarn ball wreaths before I left for the cabin. I really appreciate your sweet comments. 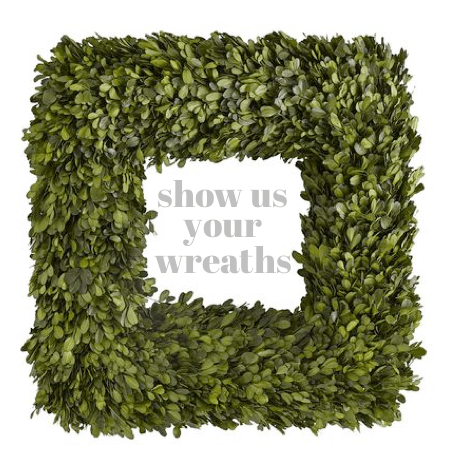 CoCo – your wreath is so pretty. I love how soft it texturally and visually! 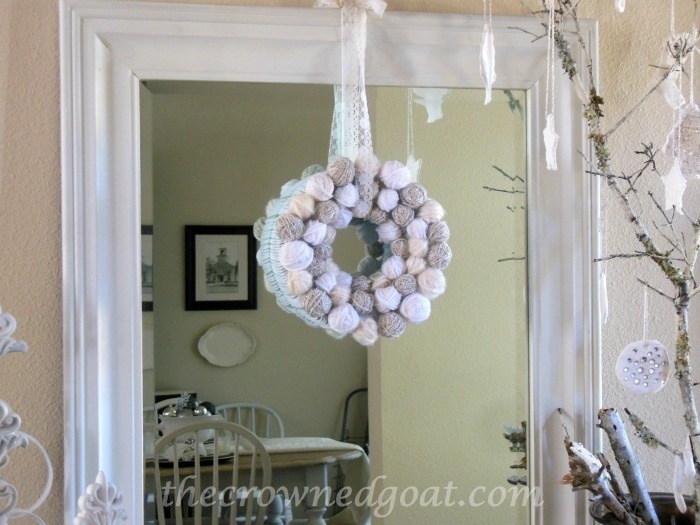 It looks wonderful with your beautiful neutral Christmas decor ! It’s beautiful CoCo! Gosh, this would look great displayed all winter too. You did a great job! Angie, that’s a great idea to leave it up through the winter. I always feel a little sad when I have to take down the decorations. Thanks lady! A.dor.able! Now I know what to do with all of that yarn I was going to crochet but never got too! Thanks Coco! They’re super easy to make Nancy! Thank you Suzanne! It was fun to make and I needed very little materials which made it even better. I can’t wait to see your pinecone wreath!